This 3-week healing plan will assist you in releasing and healing the spiritual, mental, emotional, and physical energetic imprints that can be left by abuse. If you have experienced any form of abuse—emotional, physical, and/or sexual—your inner child and body are always on the lookout to make sure abuse doesn’t happen again. Body memories and deep energetic wounds strongly interfere with the power you have to create a joyful life and your ability to experience your potential as an adult. Experiencing abuse in your childhood interferes with your development on all levels. Within this healing plan, deep energetic imprints can be released so you can nurture and develop your inner child to grow up in all areas of life. At the end of this 3-week healing plan, you will have freed your inner child and body from the effects of abuse, so that you feel safe and attract to you what is supportive. 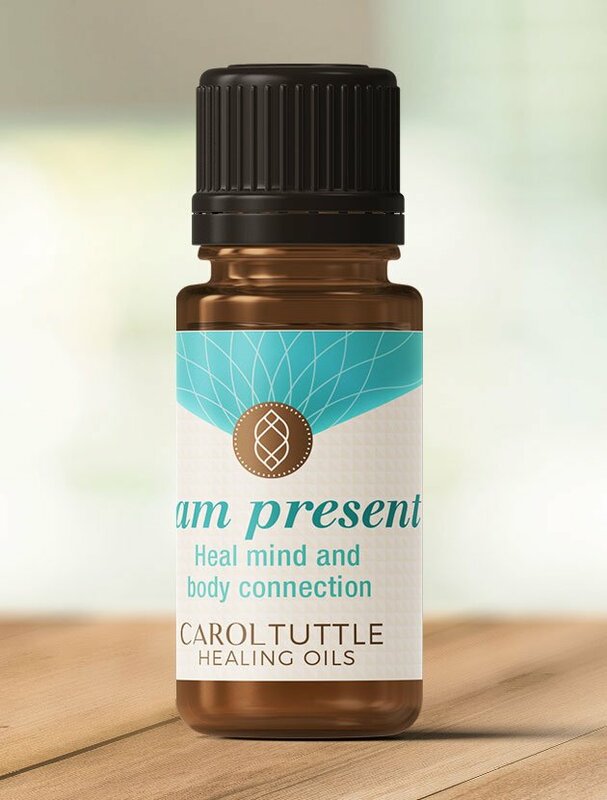 The oil customized to support you in this Healing Plan: I am present. The list may look long, but the techniques are quick once you’re familiar with them. Each technique resets your energy so that you can move forward feeling safe in the world. Listen here or download and listen on the go. Childhood abuse sets you up to develop a perception that the world is not a safe place and you are a victim. This audio session will help you create a perception of the world as a safe place where you can thrive. Do this energy healing technique when you start your day to stay clear of taking on others’ energy. A history of abuse leaves you vulnerable to taking on other people’s energy, because your boundaries were not honored. Do this technique to teach your personal energy system to have boundaries and to hold its own. Use it as many times a day as you feel is supportive. When you have experienced abuse, it is common for you to energetically leave or disconnect from your body. You may do this several times a day without even noticing. The Morning Energy Routine will teach you to stay present in your own body. Use all or parts of this routine throughout the day when you notice you are disconnecting from your body or the present moment. Do a Clearing Walk for at least five minutes a day. If you have limited time, commit to doing it two times per week for at least 10 minutes. As you walk, repeat this affirmation: “I am safe and I am thriving.” As the video instructs, see what negative beliefs come up as you do the walk. Each day, write a thought or a note to either your inner child at the age(s) you were abused, to your body, or even to your perpetrator. When you write to your inner child or your body, have that part of you write back to you. Use your dominant hand to write to them. Use your non-dominant hand to write their response. Using your non-dominant hand taps into your right brain, which monitors emotion and holds the memory of the wound created by the abuse. Using your non-dominant hand also mimics a child’s handwriting. To heighten this experience, find a photo of yourself at the age when you were abused and have it present while you write. Sound healing, using Tibetan healing bowls, helps you process, clear, and ground your energy. They activate your energy centers to help you express your true self with more ease. Listen to this track while you journal, do your clearing walk, Daily Morning Energy Routine, Spinal Flush & Zip Up, or as you fall asleep at night. Watch each healing session at least one time. Space out sessions over multiple days. (All at once is too much!) If you have time, watch each session twice. You can also watch any session at any time it would be supportive. Week 1 focuses on clearing and healing the emotion you may have never been supported in expressing when you were abused. This emotional energy hurts you and causes energetic interference in your life. Be patient with yourself this week as you tap into and clear the deep feelings that accompany abuse. Healing them frees you up to heal completely. Do this session even if you do not qualify the form of abuse you experienced as directly sexual. Since your sexual identity is at the core of who you are, your sexuality was affected by the abuse you experienced. This will assist you in connecting with your most core essence of self. Enduring abuse is one of the greatest experiences of betrayal. Your inner child may have never been able to express what it felt like to be betrayed. This session will assist you in releasing any known and unknown feelings and beliefs about betrayal and clear your energy so you no longer attract any form of betrayal in your present life. Your inner child may still be carrying deep-seated, unexpressed anger. Your adult self may also be angry about abuse that dramatically altered your personal development and perception of life. Anger often feels like an emotion you need to hang onto in order to keep abuse from happening again. But it keeps you stuck and you will only attract more life experiences to get angry about. Free yourself and your inner child by releasing anger. This session will assist you. Underneath your feelings of betrayal and anger is a deep grief and sadness that you had to experience abuse. This powerful healing session finally puts to words the grief and sadness that you feel. Expressing these emotions in word and feeling is deeply healing. This powerful session helps you visualize being a spirit in your pre-birth existence, looking down at your life before you were born. Consider the possibility that you may have had some fear and hesitation about being born into a life experience where you knew you would be abused and feel the residual effects of that abuse through your life. This healing session will assist you in clearing any pre-birth feelings, trauma, and perceptions so you can set yourself up with positive energy. The limiting beliefs you hold as your identity as a result of abuse keep you from connecting to your true identity and energetic essence. This session helps you scramble negative beliefs so you can free up your energy and claim your truth. Abuse sets you up to perceive yourself as a less valuable person. It is common for young children to blame themselves for abuse. This healing session will assist you in clearing the lie that you were abused because you were not valuable or worthwhile. As a result, you will connect with the truth you carry that you are loved and worthwhile. If you were abused, your personal energy system was violated, which set you up as being vulnerable to taking on other people’s energy. This may be so common for you that you don’t even know what it is like to maintain your energetic space and allow others to be responsible for their own energy. Learning how to “hold your own energy” is a powerful transition to growing yourself up and out of the abuse energy. Your unmet emotional needs can cause you to feel unloved and deprived. Since you were not protected from the abuse you experienced, a primary emotional need of feeling safe in the world was not met. This clearing will assist you in releasing deeply carried beliefs and feelings you took on as a child as a result of your abuse. Abuse can leave you feeling confused and stuck in a pattern of blame and control. Abuse is such a deeply wounding experience, the thinking mind is trying to figure out where to put the blame. Too often you blame yourself or live in a pattern of blaming or being blamed. Control is a by-product of abuse as a result of feeling out of control when the abuse happened. You either continue the pattern of spinning out of control, or try to control everything with a hidden agenda of making sure nothing bad happens again. This healing session will clear the old beliefs and feelings that keep running these patterns so you are free to create new, healthy patterns. Choose “Clearing for Perfectionism” if you were emotionally abused and were made to feel inadequate as a child. You have patterns of perfectionism in several areas of your life as you feel the need to make up for your false identity of not being good enough. This session will release you from the lie that you are not good enough. You no longer need to play out patterns of perfectionism as there is nothing to make up for! Choose “Clearing for Shaming Your Body” if you were physically or sexually abused. Your body took on a lot of the negative energy of your abuse and you are still abusing it with your negative perceptions and self-talk about it. This session will clear those patterns so you can start to love and appreciate your body and all it went through for you. As a victim of abuse, you would have taken on the energy or baggage of your perpetrator(s). As a result, you may be taking on others’ baggage, thinking you have to help “fix” their life problems. Carrying other people’s “energetic baggage” is a distraction from your healing that keeps you stuck and compromised. This session will teach you the steps and give you the tools to no longer take on other people’s baggage. If you have not felt like you are your own authority on what is best for you in life, this session will help you. These affirmations will help you turn within to connect with your own spiritual compass. Supports emotional restoration, clears body abuse memories and PTSD triggers, assists staying present in your body. Sodalight: Absorbs and neutralizes negative energy that bogs down the mind, heart, and body. Heart’s Wisdom: Fosters spiritual, emotional, and physical healing by increasing your emotional clarity and the awareness of your soul’s purpose.